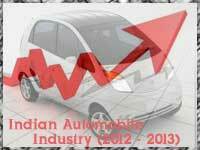 The automobile industry in India reported a robust growth rate of 26 percent in the last two years (2010-2012). The BSE AUTO Index outperformed the benchmark Nifty by 79%, 12% and 19% in FY10, FY11 and FY12, respectively. However, the sector has shown a sluggish growth of 12 percent in 2012. The trend is likely to stay with a 10 percent growth outlined for 2013 due to rising fuel costs and slow income growth.A cautious growth is expected over the next few years. However, from a long-term perspective, rising incomes, improved affordability and untapped markets present promising opportunities for the automobile industry in India. According to a research report, sale of passenger vehicles is expected to double in the next four years and growth anticipated is higher than the 16 percent achieved in the past 10 years. Two-wheeler vehicle segment is expected to show slow growth of 10 percent CAGR over the period of 2012-2016 according to the report. The Automotive Mission Plan 2016 launched by the Indian Government seeks to grow the industry to a size of US $145bn by 2016 and make it contribute 10 percent to the nation's GDP. India is emerging as a strong automotive R&D hub with foreign players like Hyundai, Suzuki, General Motors setting up base in India. This move is further enhanced by the Indian Government's support towards setting up centres for development and innovation.Also there are opportunities of growth available in alternative segments like electric cars, vehicles run on natural gas, etc.